I remember eating pork stuffed tofu back at Taiwan, my Mama would braise them in soy sauce, though tasty, they were always a bit on the salty side. I bought some large fried tofu and decided they would work well as an ingredient for this recipe, the bean sprouts made things much lighter, which meant the taste of tofu were able to shin through. There was only 1 left over and I had to battle with little girl so she would save it for next day’s lunch box… Enjoy! 1. In a medium bowl, stir together pork, scallion, 1 1/2 tablespoon soy sauce, and cornstarch. Mix until thoroughly combined. 2. 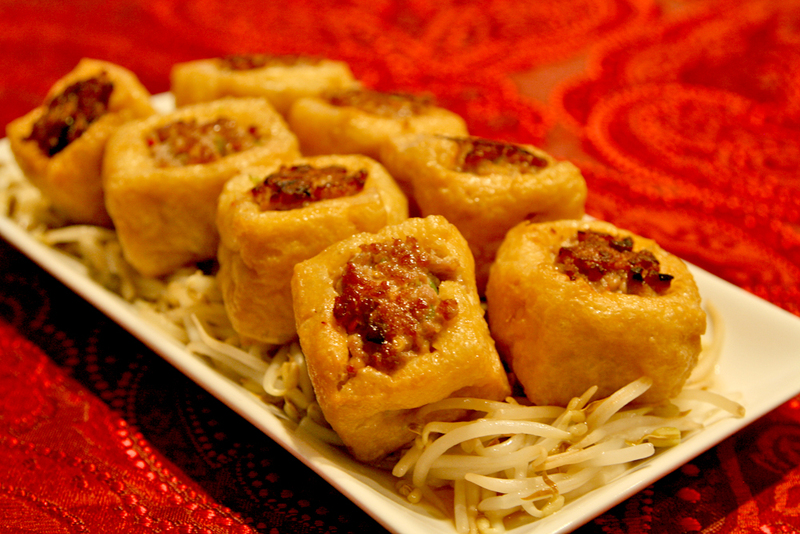 Poke a hole in the center of a piece of fried tofu, take out some of the center and stuff with pork mixture. Pack in tightly. Repeat until you finish stuffing all the fried tofu pieces. 3. Heat oil in a wok or similar pan on medium heat. Place stuffed tofu meat side down to brown the meat, about 2 minutes. Push the stuffed tofu pieces towards the sides, freeing up the center space. 4. Add sprouts (it will be a big pile) in the center and sprinkle with a little salt. Toss occasionally allowing sprouts to wilt. 5. Add 1 cup chicken broth, garlic, and remaining tablespoon of soy sauce and Magi sauce. Toss and cook covered until sprouts are tender, cover and let the steam cook the meat thoroughly. Serve with white rice. i like tofu too but i have never had it this way… stuffing it sounds like a great idea! Hello Cake Whiz! My family and I love tofu, and this definitely is an easy way to add some flavor to the normally bland tofu. If you do decide to make it, please let me know your thoughts. Happy Cooking!